BAOFENG pofung BF-UV-5R 4 Generation Black Knight is a dual band radio. 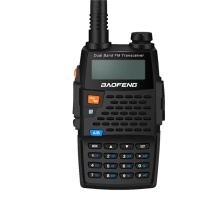 This easy-to-use radio will deliver you secure, instant and reliable communication at peak efficiency. *CTCSS/DCSS intelligent encryption, FM Radio. With luminous LCD display function, highlighting screen, and luminous key effect. *2800mAh High Capacity: Battery saving, long standby time. Cancel flashlight to ensure longer endurance time and with low voltage alert. *Stable signal and clear calling with perfect sound effect. With voice prompt and function VOX(voice operate transmission). Chinese/English Switch.